$1.99 to $129.99 & FREE Shipping on orders over $59 $35. Granular, direct application Calcium-Sodium-Bentonite preparation for clarification and protein stabilization of juices and wines with a pH higher than 3.5. Applied at a rate of 1-3g/L (4-12 g/gal) of wine. Package provides a dosage of 9.5g/gal for a 60gal barrel. The basic idea behind a fining trial is to determine the minimum amount of the fining agent that will be effective in clearing the wine. This is generally done as a two step process: First, a strong excess (5-10x the maximum recommended dosage) is added to a small sample of the wine to see if the fining agent will even be effective against the turbidity that the wine is exhibiting. Different fining agents can attack different sources of cloudiness in a wine. Second, a range of dosages of the fining agents is added to a number of different samples of the wine. The lowest effective dosage is then used to fine the whole lot of the wine. The reason for this is twofold - fining agents are to a degree non-selective and can reduce color, flavor & aroma intensity at the same time that they're clarifying the wine; and adding excess fining agent is more expensive. We recommend starting by adding 15g/L of Canaton to a sample of your wine. If you'd rather not devote an entire liter of wine to performing the trial then you can scale the sample size down to, for instance, 1.5g in 100mL of wine. After determining if this had any effect on your wine, you can move on to dosage trials. A range of 5 samples to see what will work is a good choice and so since the recommended dosage for Canaton is 1-3g/L, we suggest 1, 1.5, 2, 2.5 and 3g/L dosages. Again, this can be scaled down so that you don't use a whole liter of wine per test - 0.1, 0.15, 0.2g/L etc in 100mL samples would work quite well. If you don't have a scale capable of accurately weighing these small amounts, you can get around it with a 100mL graduated cylinder and a 5mL pipette. In the graduated cylinder, combine 1g of Canaton with 100mL of water (measure the water first so that the Canaton doesn't account for some of the 100mL of volume in the cylinder). Now each mL of the solution in the cylinder will contain .01g of Canaton. Add 10mL (0.1g) to your first sample, 15mL (0.15g) to the next sample, etc. 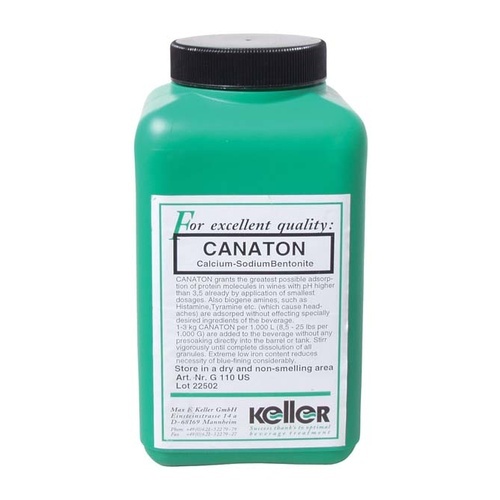 With this particular trial, you'll use the whole 100mL of Canaton solution that you made (30mL + 25mL + 20mL + 15mL + 10mL = 100mL). The Canaton will take 5-10 days to be completely effective, but should show about 80% of its effect within about 2 days. Please keep this in mind when conducting your trials. At recommendation of a brewing friend who makes awesome beer.